Prices from: $1,899 USD per person departing from New York or Boston. Taxes Included! Includes Airfare: YES, from most major Cities in USA & Canada. Accomodation Type: 4* Hotel and 5* Nile River Cruise. Domestic Flight transfers Cairo- Luxor � Aswan � Cairo assisted and transferred to the airport on an air conditioned car. 4* Movenpick Resort Cairo Pyramids, three nights with breakfast daily. 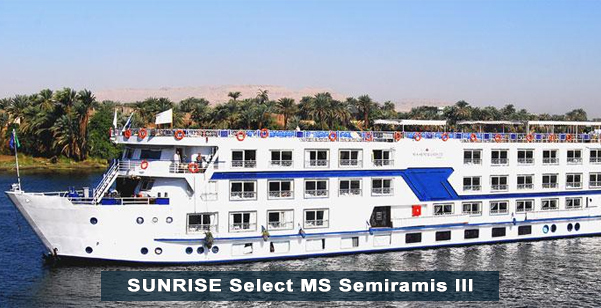 5* Semiramis Nile River Cruise, Four Nights with breakfast, lunch and dinner included daily. This tour can be extended or customized. Lunch included when visiting the Pyramids and Egyptian Museum. Breakfast, Lunch and Dinner daily while aboard your Nile Cruise. 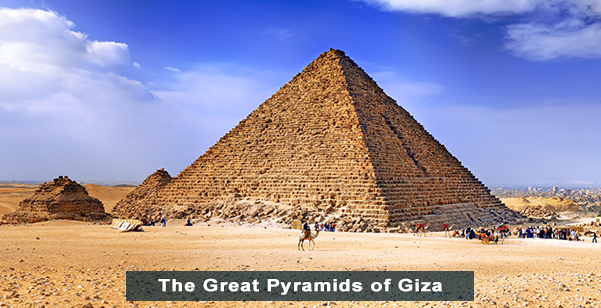 Visits to the Egyptian Museum and the Grand Pyramids of Giza, fully guided with lunch included. 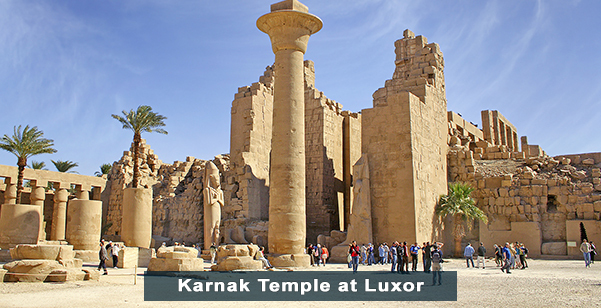 Guided tour to visit Karnak Temple and Luxor Temples provided by English speaking Licensed Egyptologist. Guided tour to visit Valley of the Kings & Hatshepsut Temple provided by English speaking Licensed Egyptologist. 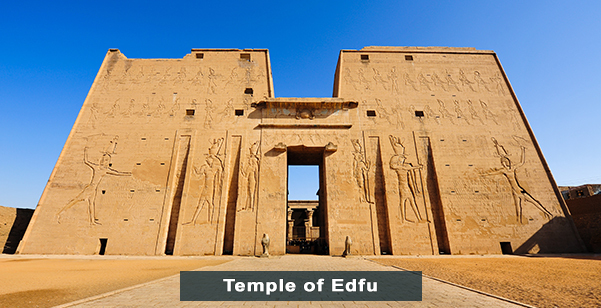 Guided tour to Edfu & Kom Ombo Temple provided by English speaking Licensed Egyptologist. Dress up in traditional Egyptian attire and enjoy a Galabeya Party Night. All entrance fees during your Cairo sightseeing Tour (except Mummy Room at Cairo Museum $15 USD). All entrance fees during sightseeing while aboard your Nile River Cruise. All transfers by and air conditioned car and English speaking guide for your sightseeing while aboard your Nile River Cruise. Assistance and Transferred to the airport on your first and last day by our English speaking guide and air conditioned Car. Extra Bonus: Camel Ride at the Cairo Pyramids a great photo opportunity. Visa on arrival at Cairo airport $15 USD Per Person. Any items of personal nature such as phone calls, laundry, drinks, etc to be paid in cash aboard Ship. Entrance to the Mummy Rooms at the Cairo Museum $20 USD per person. Water, coffee, tea and other beverages are at an extra cost aboard the Nile River Cruise. Begin your Journey to the fascinating land of Egypt! Board your international flight to Cairo. Departures are available from all major cities in the USA and Canada. Upon arrival you will be given a form to fill out and purchase your Visa. The cost is $15 USD per person. Our Representative will meet and assist you after you clear customs and immigration, then transfer you to your hotel. You will be met by our English speaking guide and travel by an air conditioned car. Our packages include 4* Movenpick Resort Cairo Pyramids with daily breakfast included. Upgrades are available. 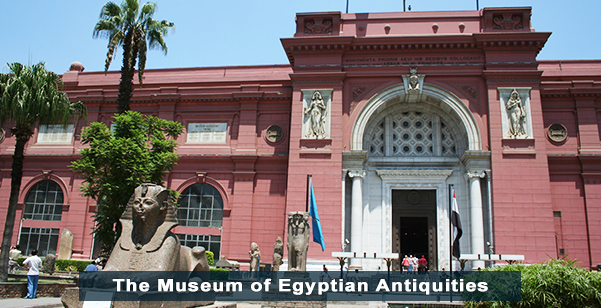 After breakfast our Guide will take you to the Cairo Museum of Egyptian Antiquities stroll through the halls of one of the most fascinating Museums you will ever visit. Established in 1902 holds a collection of over 120,000 treasures from ancient Egypt, from objects found in Tutankhamen's Tomb to real Mummies. The Museum holds riches from many of the sites that you will visit later on during your tour. Our guides purchase your entrance fees in advance, which is a great help line ups can be long and confusing. The only fee to pay is the entrance to the Mummies room, $15 USD. 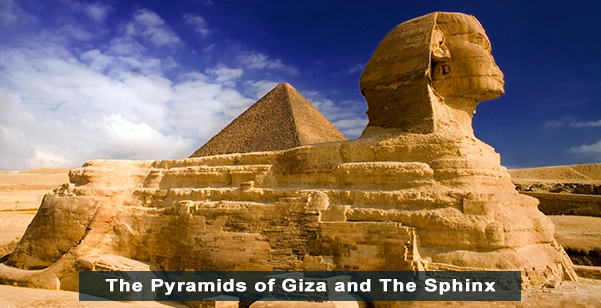 Next visit the Giza Plateau, composed of The Sphinx and the Three Great Pyramids, One of Egypt's most famous and recognized sites. 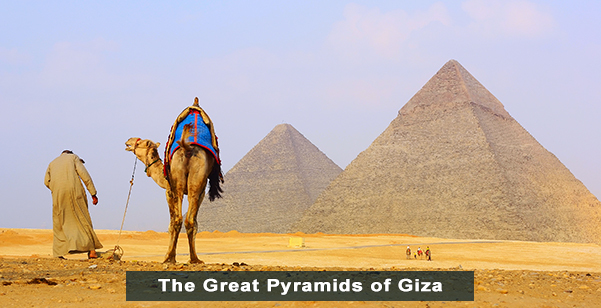 The Great Pyramid of Cheops dating back to more than 2,600 years before the time of Christ is considered one of the Wonders of the Ancient World still standing at this UNESCO World Heritage Site. And of course the mysterious Sphinx, carved almost entirely from one piece of limestone. Fly to Luxor to begin your Nile River Cruise, included in this package Semiramis Nile River Cruise. Breakfast, Lunch, Dinner and all excursions included daily. The East Bank starting with Karnak Temple, a massive complex built over a thirteen hundred year period. The complex is made out of 3 temples situated on 247 acres of land, enclosed by enormous walls. Karnak Temple is considered to be the largest temple complex ever built, constructed to honor God Amun of Thebes. 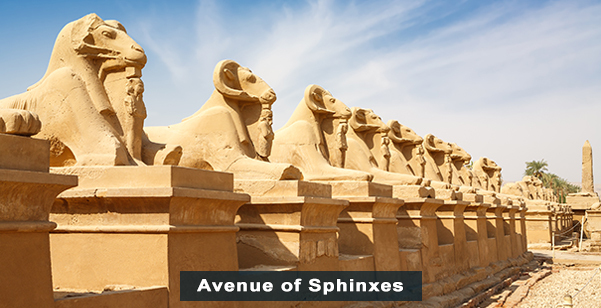 Stroll through the Avenue of the Sphinxes, an avenue connecting the Karnak and Luxor Temples lined with sphinxes. You can take a horse drawn carriage down the avenue, a path the ancient Egyptians took in their pilgrimage to Luxor Temple. Luxor Temple: Built alongside the river Nile, one of the most magnificent temples of ancient Egypt, built to honor God Amon Ra (King of Gods). Hundreds of Sphinxes once lined the road to nearby Karnak Temple, processions will take place between the two temples during the Festival of Opet. It was from Luxor Temple that an Obelisk was removed and sent to France in 1874, it now sits at Place de la Concorde in Paris�. Breakfast, Lunch, Dinner included. Overnight in Luxor aboard ship. The West Bank Starting with the Valley of the Kings, where the tomb of Tutankhamun and its solid gold coffin was found, (which is now kept in Cairo's Egyptian Museum). The Valley of the Kings is a Necropolis were several great Pharaohs and nobles were buried. This site is considered a World Heritage Site. Video equipment is prohibited. 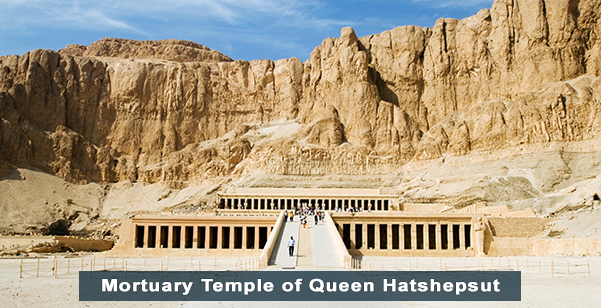 Queen Hatshepsut Temple: Dedicated to the famous Female Pharaoh, the fifth Pharaoh and the first female Pharaoh. Set at the head of the Valley, it has a very unique design, you can see her many defaced statues this ordered by her son in law Tuthmosis III after her dead. 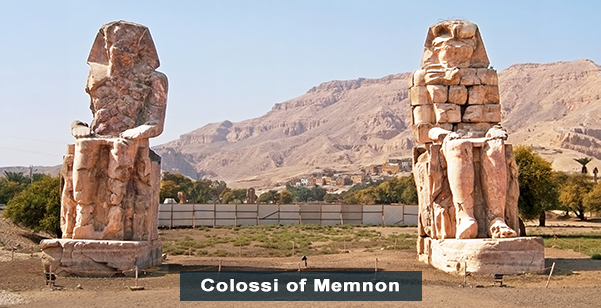 Colossi of Memnon: These two gigantic statues (75ft high, one thousand ton) is all that remain of the Temple of Amenhotep, believed to be one of the most largest and opulent. Continue sailing and you arrive at Edfu. 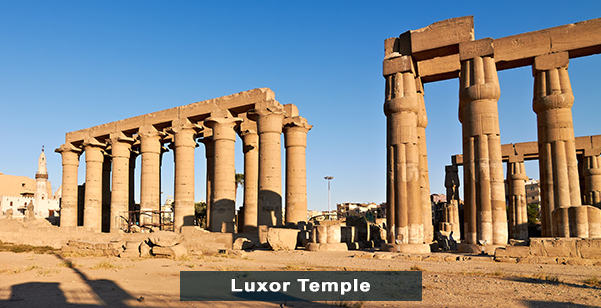 A small agricultural town known for its sugarcane production located just between Luxor and Aswan, here you find one of the most important temples in Egypt. Breakfast, Lunch, Dinner included. Overnight in Edfu. Built in the Greco Roman Era the Temple of Edfu, is the most well preserved and complete Egyptian temple, built to honour Horus the falcon headed god. The walls are lined with inscriptions and hieroglyphics depicting the age old struggle between Horus and Seth, This impressive example of the Ptolemaic architecture is said to have taken 180 years to complete. 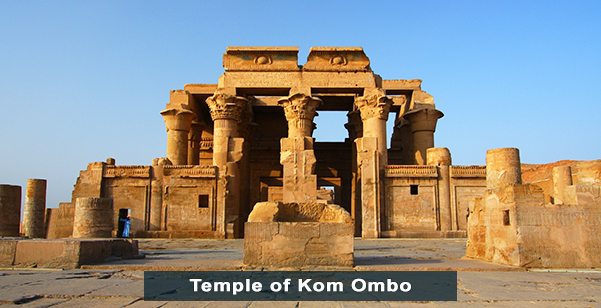 Overlooking the Nile you find the Temple of Kom Ombo in the town of the same name located 45 km north of Aswan. Built to honor the crocodile and Falcon Gods Sobek and Horus, dating from 180 BC it has beautifully carved columns some of them still keep their original brilliant colors. Breakfast, Lunch and Dinner included. Overnight in Aswan. The High Dam: On the border of Egypt and Sudan, is the world longest, 3,830 meters in length, completed in 1970, one of the most beneficial engineering achievements for the people of Egypt, the Dam protects from floods and provides electricity and irrigation. Its construction created a huge reservoir known as Lake Nasser. Many of the Monuments that were on the way of the Dam's construction were relocated to higher ground, these relocations required amazing efforts. Granite Quarries with the Unfinished Obelisk: Aswan provided much of the red granite used for all the monuments in the Temples and Tombs, learn the history of these Quarries. On the northern part of this site you will find the Unfinished Obelisk still lies attached to the bed rock, it is said it was abandoned when a crack appeared, its calculated weight is 110 tons, it would have been the world's largest piece of stone ever carved. 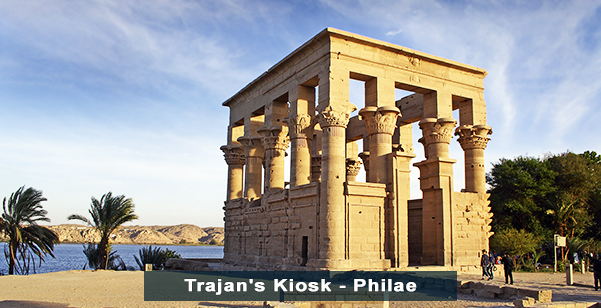 Temple of Philae: Dedicated to the Goddess Isis, originally located in the Island of Philae. This Temple Complex was rescued by a joint venture of the Egyptian Government/UNESCO, it was endangered due to the construction of the Dam. Now located on the Island of Agilkia. A beautiful setting with various shrines and sanctuaries. 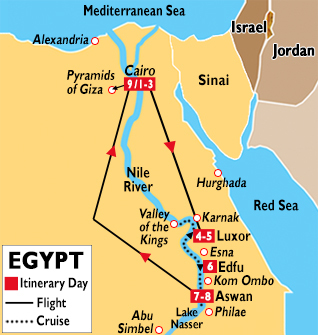 Disembark your cruise and fly to Cairo. Stay overnight at the Movenpick Resort Cairo Pyramids. Our Guide will assist you with your arrangements for your journey back home.